In the category of unique cases, the Naztech Sport may take first place. It can be worn on the belt, your arm by way of a moisture resistant strap, around your neck, and just about anywhere with the included utility clip. However, its performance is greatly overshadowed by its "unique" appearance. 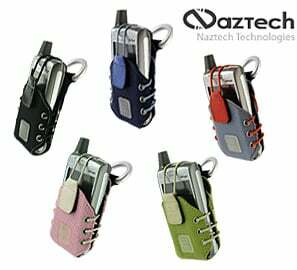 The Naztech Sport is essentially a pouch case that retains the phone with a Velcro strap. It’s made of a thick, cordura styled fabric and lined with a microfiber cloth. It is a well constructed case with solid stitching and the sturdy fabric choices. 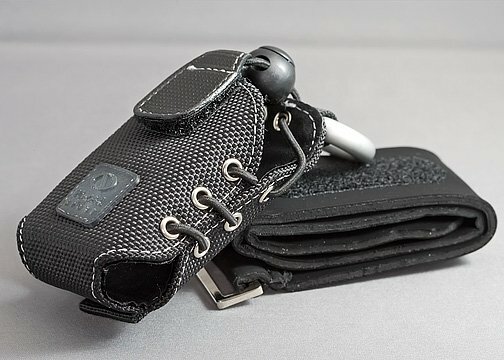 The tension of the case can be adjusted by pulling on the Velcro strap, which tightens the lacing that holds the sides of the case together. I’ll go ahead and cut to the chase with this review. Naztech offers a lifetime warranty on the Naztech Sport and I imagine that’s because after using it once, it spends a lifetime in the junk drawer of the kitchen. This case, by any stretch, is not suitable for any phone with an exposed keyboard. To its credit, Naztech markets this case for iPods, small cameras, and other MP3 Players which it may be better suited for. I could even see it being used with clamshell phones where the keypad is protected. But my Samsung BlackJackII was difficult to place in the holster and once fitted, all it took was shifting the phone the slightest to activate programs. I tried my wife’s Treo 680 in the case and not only did it activate features via the keypad but also the touch screen. My nerves could only take using the case for a short period of time. After the case hit redial and I unknowingly called home, I gave the case a rest. I did find that the Naztech Sport did ride well on the belt, the neoprene armband fit snugly and secure (didn’t slip down my arm) but the weight was a little too much to wear it as a necklace. I didn’t care for the Utility Clip because the case bounced around too much. 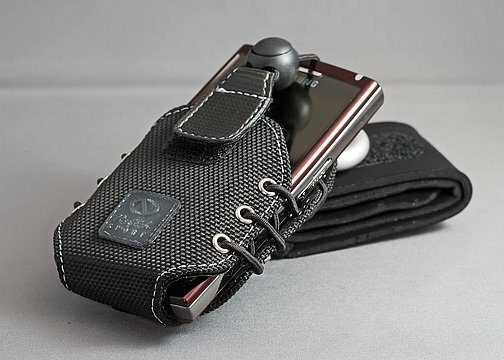 Naztech offers some really nice leather cases but the Naztech Sport leaves a lot to be desired as a carry option for any phone with a keypad or touch screen. I did loan the Naztech Sport to my teenage son to carry his Samsung flip-phone in and his reaction was “cool case dad”. He still prefers the Golla Parrot Case better because of the extra storage pockets, but there may be a market for this case after all.